Wash and dry hands to remove oils and dirt. Clean the screen of your phone using provided cleaning cloth. Align the screen protector with edges of your device; ensure STEP 1 TAB IS FACING DOWN. Wrap the two rubber bands around the top & bottom of the device/screen protector to secure it into place. Realign protector if needed and place two Hinge Stickers (included) in between rubber bands to secure the protector to the phone. Once the stickers are secure, remove the two rubber bands and set aside. Flip the protector over using the hinge, so the STEP 1 TAB now faces up. Repeat screen cleaning from PREP. Holding onto the Step 1 Tab, slowly peel back and remove the protective, film layer. 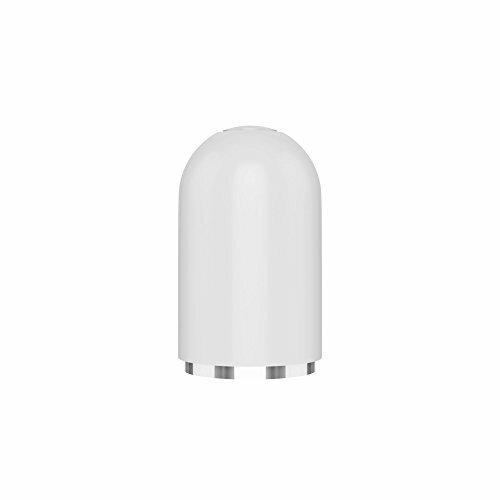 Carefully, but quickly flip the protector back over, onto the screen of your device. Make sure it is aligned and secured to the screen. Use the squeegee card to remove bubbles if needed. Hold onto the STEP 2 TAB and slowly peel back just the corner of the protective, plastic film at a slight angle. Then remove this entire film layer, along with the tape. Use the squeegee card to remove any last bubbles. Carefully lift "Step 1 Tab" and begin to peel protective film back 1-2 inches to expose the adhesive side of the screen protector. Turn over the screen protector, and align the cut-outs appropriately on the bottom of the phone. Apply the exposed adhesive side of the screen. After the bottom of the screen protector is aligned and attached, continue to remove the first protective film from underneath the actual screen protector. Use the squeegee card to gently roll the screen protector onto your device. Using the provided squeegee card, wrapped in the cleaning cloth, remove any air bubbles that you may have formed during installation. Lift “Step 2 Tab” carefully and remove the second protective film on the screen protector. Carefully fold the edges of the screen protector over the edges of the phone. Press firmly on the edges to make sure the screen protector is completely sealed. Use our tips below to help achieve the best results during installation . . .
Each screen protector consists of 3 layers of film. 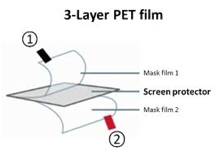 The front and back film layers are protective, mask films (where the Step 1 and Step 2 stickers are affixed) and are used for packaging/shipping purposes ONLY. The actual screen protector for your device is the film in the middle. Please use the stickers like "handles" to assist you in in grasping and removing the mask film layers. DO NOT remove the actual stickers themselves. Discard the 2 outer protective film layers after installation. Installation should always be done with your device turned off and in a well-lit, dust-free, environment. Consider doing your installation in the bathroom after a hot shower. The humidity will keep dust particles to a minimum and allow for optimal installation conditions. The included dust removal stickers can be used to remove dust from the screen and the adhesive side of the screen protector. To use, simply touch the adhesive side of the sticker onto the dust and, as you remove the sticker, the dust will also be removed. And remember … don’t stress out over the installation process! If you have any difficulty, or damage the product during installation, we have you covered under our Lifetime Guarantee. Contact us and we will send you a free replacement so you can “give it another go”! A. We highly recommend the “Rubber Band Hinge Method” of installation (above) for any beginners, or for anyone having difficulty installing their screen protectors. You can view a demonstration of this method at the top of this Installation Page. In the meantime, please try using this method to help install the second, “back-up” screen protector that is included in the package. 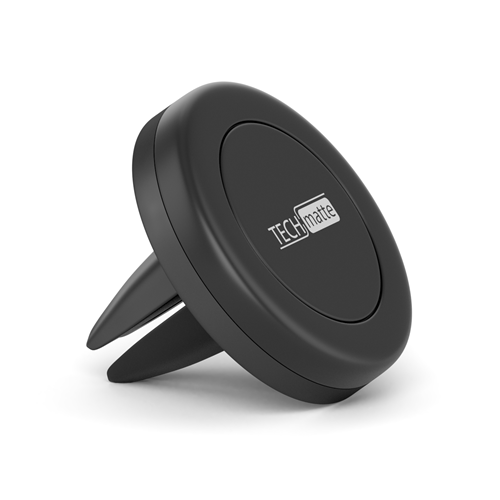 Also, you may contact us at support@techmatte.com to receive a replacement to “give it another go” or if you need further assistance with installation. A. We apologize for any inconvenience this has caused. It seems as if your protector may have been damaged during shipping. Please contact us at support@techmatte.com to receive a free replacement item, compliments of our hassle-free, lifetime replacement warranty on all screen protectors. A. It is possible that the reason for this 'cloudy' appearance is due to the fact that you have purchased the Anti-Glare version of our screen protectors. 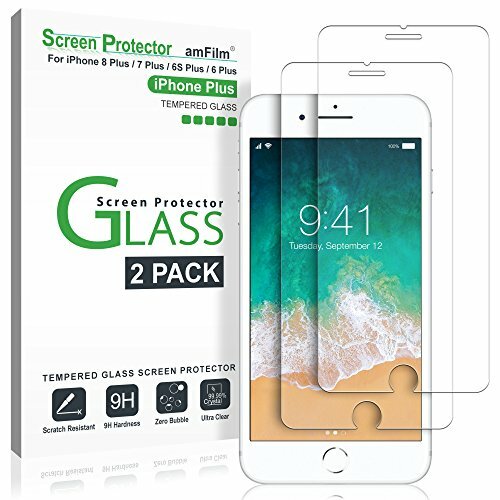 In order to be effective at reducing glare and fingerprints, these protectors are made with a clear, matte material and can produce a slight pixilation of the devices’ screen clarity. This is the natural effect created by the matte (anti-glare) frosted texture and you may be more satisfied in purchasing one of our HD Clear screen protectors. A. 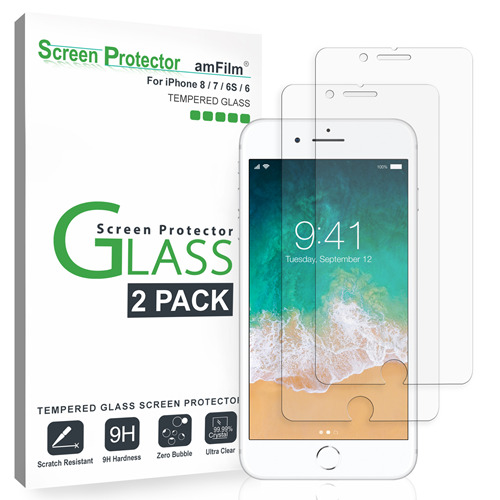 We assure you that our screen protectors are made of the highest quality PET Materials on the market and are designed to be as thin as possible, yet still retain maximum scratch resistance. At times it is possible to experience some initial resistance scrolling when the screen protector is first applied. If you “break it in” and continue to have problems with the scrolling/motion, it is possible that you may have received a defective product. Please email us at support@techmatte.com and we will be more than happy to help solve this matter.